Captain, United States Army, Company F, 99th DVI. Born at Cadiz, Ohio, December 11, 1835. Died at Washington, D.C., January 21, 1895. "At Chicakamuga he commanded his regiment, then in Stedman's Division, Thomas' Corps, his ranking officers having been disabled early in the battle. strife to reign with thee on high. Where the anthems of rapture unceasingly roll, and the smile of the Lord is the feast of the soul." Coshocton, Ohio. Died at Washington, D.C., February 8, 1902. Captain, United States Army, Assistant Quartermaster of Volunteers. Footnote of Anderson Parker Lacey gravesite. A mix of old and new families helped rebuild the area after the war. 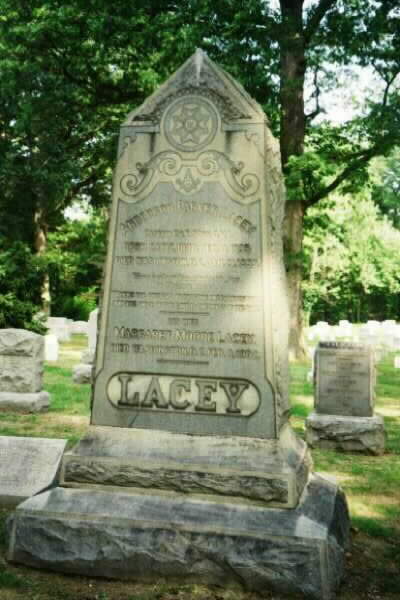 North of today's 11th Street (Bluemont section of Arlington, Virginia), a Union Army officer from Ohio named Robert S. Lacey stayed to settle.